It’s mid-afternoon on a blistering day in South Florida—around 95° F in the shade—and Joleen Heiderich is standing aboard a bright-red tow boat, peering out at the Miami skyline as it fades in the distance. The vessel is typically busy bailing out run-agrounds and derelict ships. But today, it’s taking Heiderich, a graduate student in the MIT-WHOI Joint Program in Oceanography, offshore into the Florida Strait—the piece of ocean between the Florida’s eastern coast and the Bahamas and the starting point of the huge, powerful Gulf Stream. Perched below Heiderich on the deck is a human-sized underwater vehicle, which she assembled and tested over the past two days with Woods Hole Oceanographic Institution engineer Patrick Deane. Launched from the ship, it will autonomously glide back and forth across the Gulf Stream during a four-month journey north to Cape Cod, Mass. 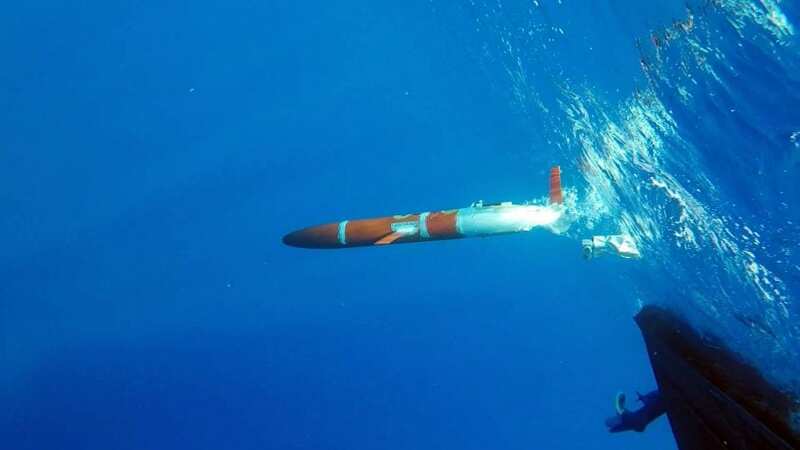 The robotic orange-and-white vehicle, known as a Spray glider, is the workhorse of a research program led by her advisor, WHOI physical oceanographer Robert Todd. Heiderich and Todd are using a fleet of Spray gliders to take routine measurements of the Gulf Stream along the U.S. East Coast. The goal is to learn more about the Gulf Stream—in particular, the current’s ability to transport heat northward—and how it varies in time and space as it flows. The current has a huge impact on global climate patterns and coastal sea levels along the Eastern Seaboard. At the same time, the scientists also want to understand how hurricanes affect the Gulf Stream. “Both of these questions have significant direct societal impacts, particularly for people living in coastal communities,” Heiderich said. About every two months, the scientists launch a glider from Miami to wend its way to Woods Hole. Their goal is to keep two gliders in the Gulf Stream at all times—one north and one south of Cape Hatteras, North Carolina. The gliders dive through the water in a zigzag fashion—up and down, up and down, for months at a time—measuring seawater temperature, salinity, and current velocities in the upper kilometer of the ocean. Every few hours, each glider surfaces, rolls on its side and lifts one of its wings out of the water to transmit its data via satellite back to the scientists in Woods Hole. “Once a glider reaches Cape Cod, we retrieve it, refit it in our lab, and then bring it back down for another mission,” Heiderich said. Todd also routinely deploys Spray gliders off North Carolina as part of an ongoing multi-institutional project known as PEACH (Processes driving Exchange At Cape Hatteras). Collaborators include WHOI physical oceanographers Magdalena Andres and Glen Gawarkiewicz and colleagues at the Skidaway Institute of Oceanography, the University of North Carolina, North Carolina State University, and the UNC Coastal Studies Institute. Together, they have deployed moorings, autonomous underwater gliders, and land-based radars since 2017 to measure oceanic and atmospheric conditions at a major confluence of currents, including the Gulf Stream, near Cape Hatteras, an area that juts out into the Atlantic and is often affected by hurricanes. By being in the water year-round at locations prone to hurricanes, the Spray gliders are helping to fill a critical gap in our knowledge of the ocean’s role in hurricanes. Over the last half-century, scientists have made great strides in forecasting the “where” and “when” of hurricanes along the East Coast. But forecasting storm intensity has been more difficult. That’s because scientists have been missing critical information: the heat stored in the upper thousand meters of the ocean. Large storms gather energy from warm water at the ocean surface. As high winds blow across the water, they can mix this warm surface layer with cooler water hundreds of feet below. If the warm surface layer is thin, cold water mixing to the surface will rob storms of their strength. But if warm waters extend down deeper, the surface will stay warm, even as deeper waters are mixed to the surface, giving the storm more energy to continue growing as it moves. Meanwhile, satellites provide good measurements of the surface temperature of the ocean, but they give little information about heat stored below the surface. So autonomous vehicles such as Spray gliders offer a trove of previously unattainable subsurface measurements. Along with critical temperature data from various depths along the Gulf Stream, the gliders also measure the Gulf Stream’s speed. The velocity at which the current moves up the coast is indicative of how fast it will carry heat northward. Typically, it flows along the U.S. East Coast up to Cape Hatteras, where it veers from the continental slope and heads east toward Europe. But can a hurricane be strong enough to cause one of the world’s strongest ocean currents to slow down? The answer—stunningly—is yes, albeit temporarily, as Todd, Heiderich, and colleagues reported in a recently published paper. According to glider data collected in 2017 during one of the worst Atlantic hurricane seasons on record, hurricanes Jose and Maria bore down on the Gulf Stream to such an extent that the mighty current slowed by an estimated 25 to 40 percent for about two weeks. “The hurricanes produced strong winds opposing the Gulf Stream as it flowed northeastward along the East Coast,” Heiderich said. This, among other factors, might have led to the Gulf Stream slowdown. A few weeks later when things were calm, the Gulf Stream was back at full strength. 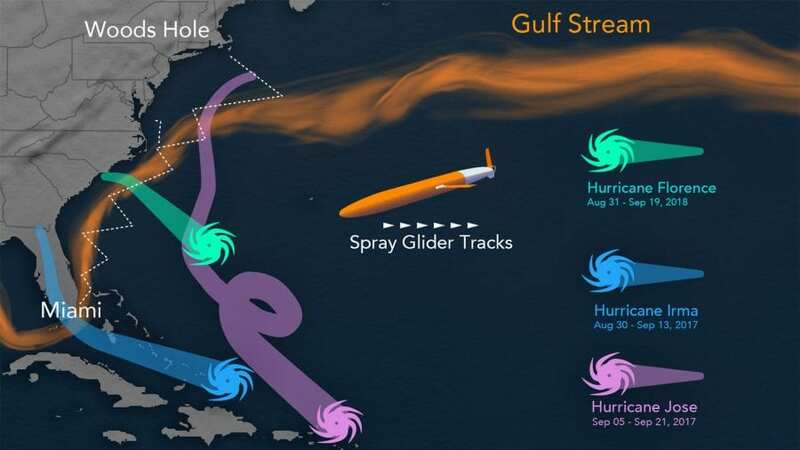 “The glider provided a unique, high-resolution view of the Gulf Stream’s response to hurricanes in 2017,” Todd said, and its data will help us to understand the processes by which hurricanes can affect a strong ocean current. Heiderich’s initial exposure to underwater gliders was, in part, by happenstance. She grew up far from the coast in Germany but later discovered a passion for the ocean from sailing trips. When a friend told her that Woods Hole Oceanographic Institution offered summer internships for college students, she combed the WHOI website for “researchers doing exciting science” and discovered Robert Todd. “He was using gliders to research hurricanes, which to me seemed really cool,” she said. “So I reached out to Robert and ended up at WHOI for the summer of my junior year” in the WHOI Summer Student Fellowship program. During that summer, she worked on the TEMPESTS (“The Experiment to Measure and Predict East coast STorm Strength”) project, a program that used rapid-response deployments of gliders and other observational platforms to investigate storms affecting the U.S. East Coast. The project highlighted the need for sustained observations like the current Gulf Stream glider program to improve storm intensity forecasting. 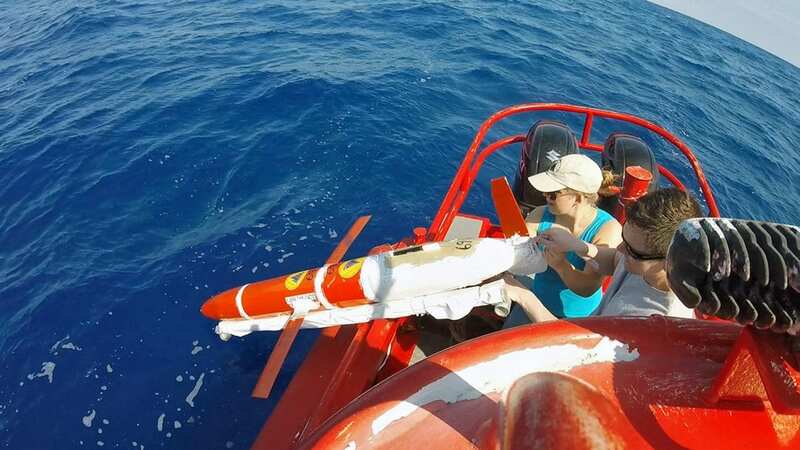 She has continued working with glider data as a graduate student in the MIT-WHOI Joint Program. As the towboat makes its way through the Gulf of Mexico into the deep indigos of the Florida Strait, it creeps to a halt and the scientists get ready to launch the glider. The Spray glider is slowly released into the water from a slide off the side of the boat. A few moments later, it gets right to work, taking its first of many dives into the stratified layers of the Gulf Stream as it zigzags its way up the coast. By providing insights into how the Gulf Stream affects hurricanes, and vice versa, Heiderich hopes the data will ultimately help strengthen hurricane forecast models. As Hurricane Florence bore down on the North Carolina coast in 2018, a Spray glider was headed southward off the Outer Banks. Back in Woods Hole, Todd and Heiderich received the glider’s observations in near real time and could relay them right on to hurricane forecast modelers. All of the other PEACH observing tools were also active near Cape Hatteras, providing key real-time measurements of Florence’s impact and a trove of data for future analysis. This research is funded by the National Science Foundation (NSF), the Office of Naval Research (ONR), the National Oceanic and Atmospheric Administration (NOAA), Eastman Chemical Co., and WHOI. 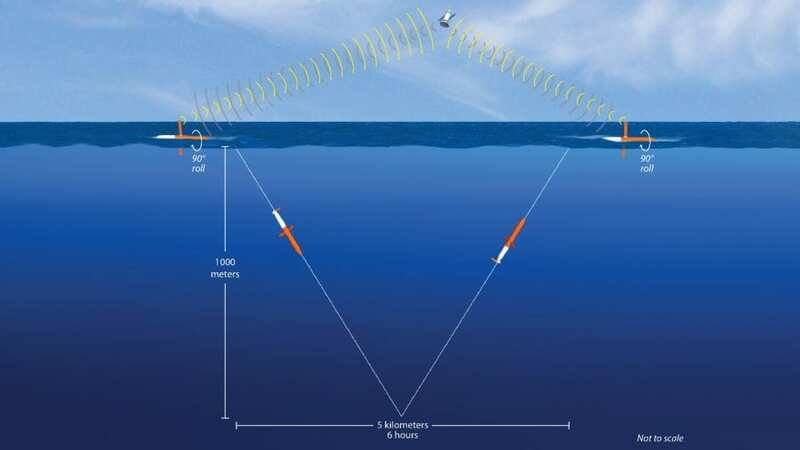 The Instrument Development Group at the Scripps Institution of Oceanography, UC San Diego provides invaluable support to the WHOI Spray glider operations.